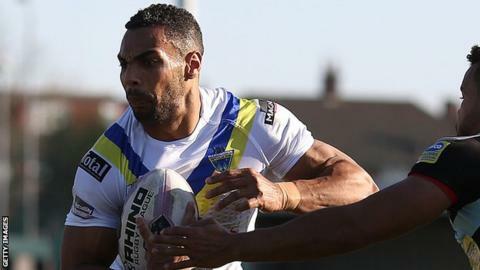 Warrington fought back from a half-time deficit to beat Hull KR and progress to the fifth round of the Challenge Cup. The home side led at the break through Ben Cockayne and Adam Walker scores, with Ryan Atkins and Joel Monaghan touching down for the Wolves. Rhys Evans and Ade Gardner traded tries, before Atkins' second and a Roy Asotasi effort put Warrington in front. Omari Caro crossed for Rovers with four minutes left, but the visitors held their nerve in a tense finish. Warrington have a fine recent history in the competition, having been Challenge Cup winners in three of the five previous seasons, while the Robins 34-year wait to lift the trophy has been extended. But the second of centre Atkins' brace, quickly followed by Asotasi's score, opened up a 10-point advantage for the Wolves and it was one they did not surrender, despite Caro's late consolation. "It was a very close game and the bounce of the ball was the difference. The players worked hard for each other in tough conditions. "We had a few opportunities in the second half but Warrington aren't a top-class side for nothing." "We made hard work of it at times. We turned the ball over not on the terms we would have liked, but I'm very pleased to get through. "It was a good game and both sides showed how much they both wanted to win the game. There were opportunities for both teams to win and fair play to Rovers for fighting hard." Hull KR: Cockayne; Gardner, Salter, Welham, Caro; Burns, Keating; A. Walker, J. Hodgson, Weyman, Larroyer, Cox, Costigan. Replacements: Carlile, Green, Netherton, Lovegrove. Warrington Wolves: Russell; R. Evans, Bridge, Atkins, J. Monaghan; Ratchford, Myler; Hill, Higham, Asotasi, Waterhouse, Westwood, Grix. Replacements: M. Monaghan, Wood, Laithwaite, B. Evans.